Integrated irrigation and aquaculture in West Africa HALWART Matthias, VAN DAM Anne A.
Auteurs : HALWART Matthias, VAN DAM Anne A. 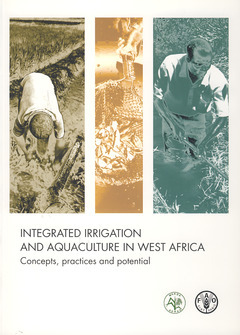 This volume contains background documents and papers presented at the FAO-WARDA Workshop on Integrated Irrigation Aquaculture (IIA) held in Bamako, Mali, from 4 to 7 November 2003, as well as the findings of FAO expert missions on IIA in the West Africa region. The rationale for IIA development lies in its potential to increase productivity of scarce freshwater resources for improved livelihoods and to reduce pressure on natural resources, which is particularly important in the drought-prone countries of West Africa where water scarcity, food security and environmental degradation are priority issues for policy makers. Irrigated systems, floodplains and inland valley bottoms are identified as the three main target environments for IIA in West Africa. Many examples of current practices, constraints and potential for development of IIA are provided. Concepts of economic analyses of IIA are reviewed, and an overview of regional and international research institutions and networks and their mandates as it relates to IIA is given. Key factors for successful adoption of IIA - participation of stakeholders and support for local development, an integrated, multisectoral approach to IIA, and improved knowledge management and networking - indicate the way forward and are reflected in a proposal for IIA development in West Africa.